CVLSC hosted the Tokio Marine RS Feva 2018 Inland Championships over the weekend of 17th/18th June. 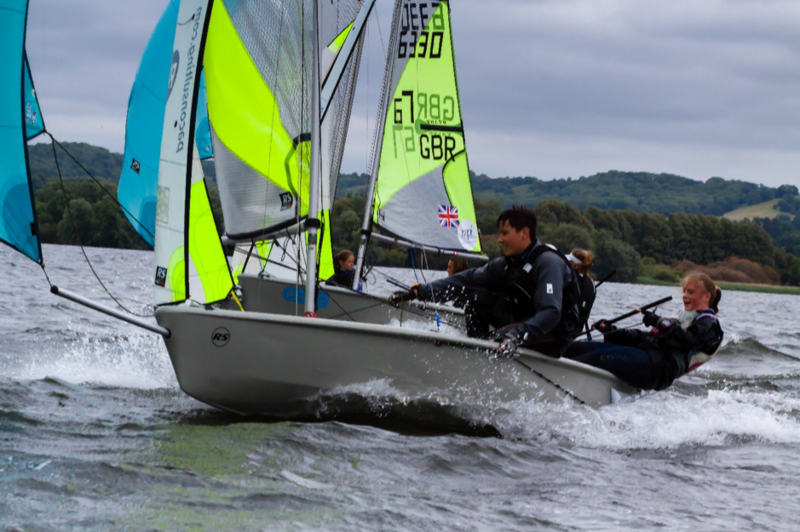 With so many keen Feva sailors at the club it was great to be able to host the national Feva fleet to Chew Valley Lake to showcase our beautiful and friendly club. Four fully crewed Chew boats; Quinn & Fin, Ted & Rupert, Rosie & Susie, William & Ed, plus Ben, crewing for south-west squad team mate Amy Boyle from St Mawes, were joined by 26 visiting boats. Conditions on the Saturday were breezy, with some healthy gusts and shifts. This put a premium on a good start and first beat, which enabled the first couple of boats to break free from the pack as they were able to plane down the run, leaving the main pack fighting for clear air and often having to switch to soaking low to maintain VMG. Race Officer, Rob Mitchell, turned around a very quick 3 races on the Saturday, and it was Ben Hutton-Penman & Archie Kemp in first with 4 points, followed by Ralph Neville & Rupert Jameson with 7 points. Immediately after racing it was on to a 29er taster session for most of the competitors. 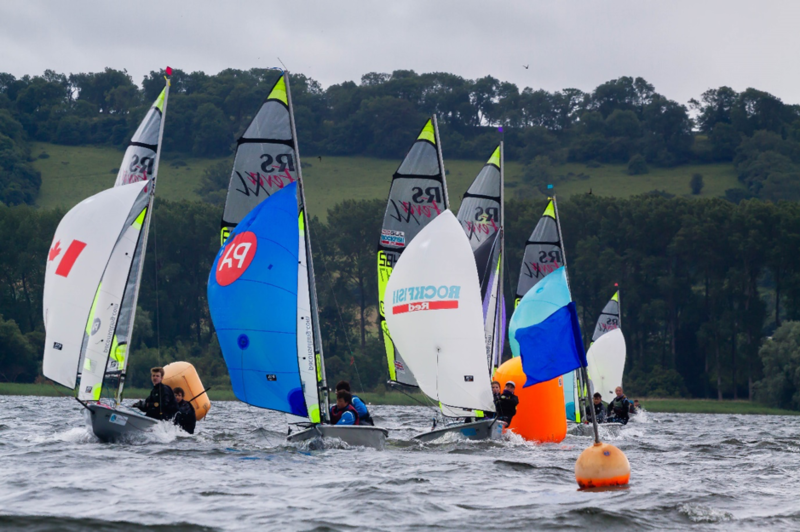 This was organised by the 29er Class Association as many of the Feva sailors move on to the 29er. By now the wind had switched around to the West, and while the club anemometer was reading around the low teens, it was fairly clear to most that it was much, much breezier 100 yards out from the club. Ted & Rupert elected themselves as the guinea pigs in their 29er, and bravely launched in front of the gathered crowds, while bets were placed on how long they would remain upright. 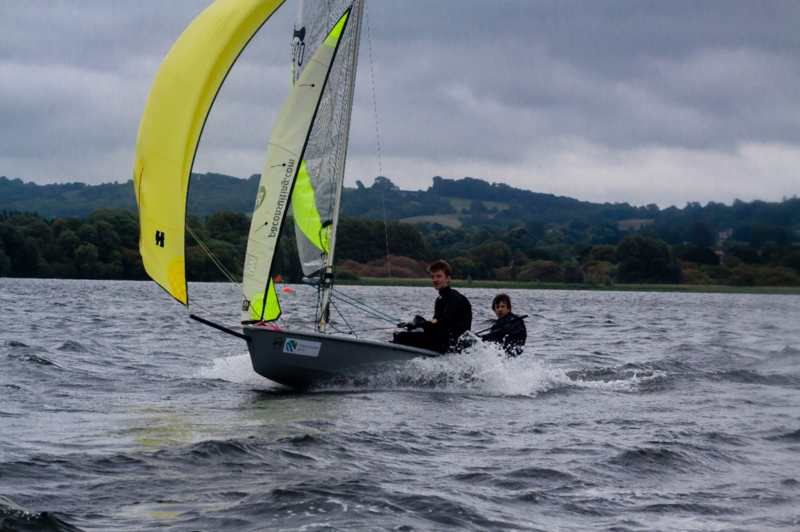 Answer: just over 90 seconds… Rupert Jameson, with Toby Atherton (a 29er National Squad member) then launched after having given a rigging demonstration on the shore to the gathered Feva sailors. After several capsizes they made it back to shore unassisted, but it was agreed by all that it was a little breezy for a first go in a 29er. So, it was on to an excellent BBQ produced by Rob, and while the competitors organised a table football competition, other Rob (Mitchell) opened the bar for the parents and did a full shift, only closing the bar at around 10pm. Sunday it was on for 4 races back to back, also bringing 2 discards into play. The day started with slightly less breeze than Sunday, but slowly increased, and moved left, as the day went on. Quinn & Fin found another gear in the first race of the day and took a well deserved third. Ted & Rupert had a good second race with a Top 10 finish. Rosie & Susie were consistent with all four results in the early 20s. 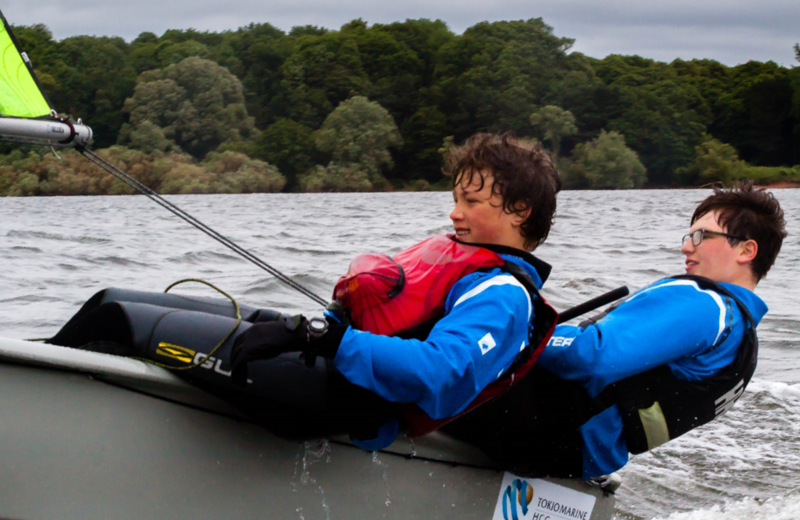 William & Ed competed hard but after a few capsizes made the decision to head for the warm showers after the third race. Ben crewing for Amy had a strong last race with a 9th place. 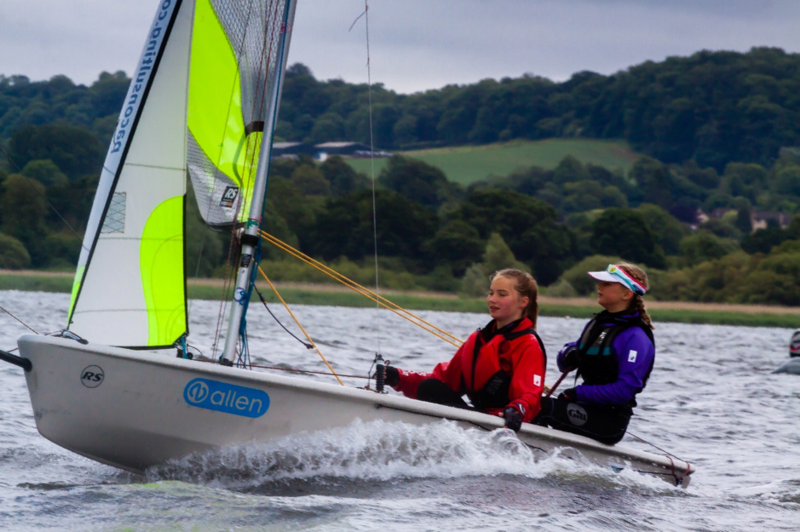 After a great weekend of sailing Ben and Archie from Corinthian Otters were crowned RS Feva Inland Champions, top girls went to Ching Wong and Eleanor O’Leary from Island Barn Reservoir SC in 5th place. 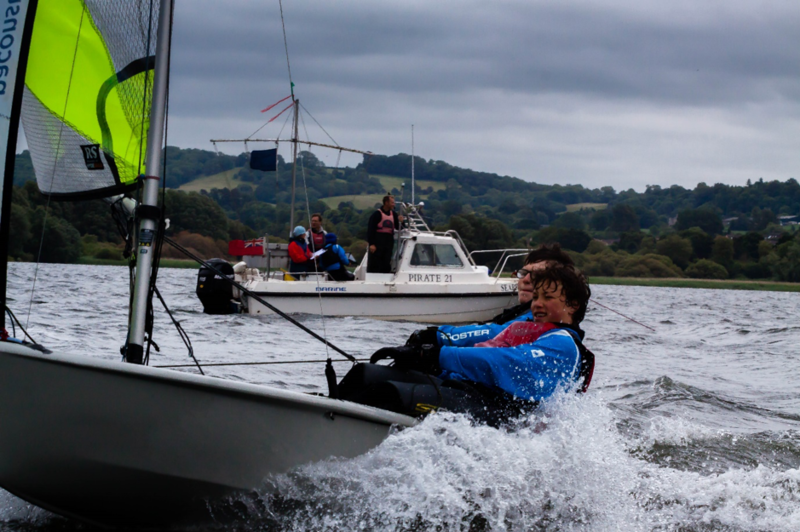 Top local boat went to Quinn & Fin in 11th place, just a few points off 7th, and the Endeavour prize for finishing all races went to Megan Rhodes and Hugh Wylam from SWYSA. A huge thank to both groups, the sailors for their polite and happy manners, and to the whole of the Chew team responsible for putting together such a great weekend. Special mention to Gus as the Event Organiser, the Laser fleet volunteers who staffed most of the volunteer positions, and finally Rob Mitchell who did double duty as both Race Officer and barman. It was great to be part of the event and to receive so many positive comments from our visitors.